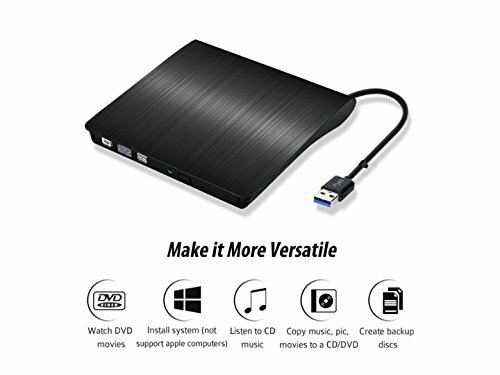 Blu Ray Reader - Using this superdrive for your ultrabook, netbook or PC, you can playback CD / DVD / Blu Ray, which will give you perfect effect when you are watching DVD videos, installing software, or create backup discs, etc. Please hook up the device to the direct USB port on your computer. If you connect it to a USB hub or extension cords, it maybe cannot recognize the Driver or not read the disc. - If you connect our external drive through USB hub,USB extension cable or frontal USB interface,it may can not run smoothly because it can get insufficient power from computer. - If our external drive can not play DVD on your windows computer,maybe this is not the fault of external drive. - Since the Windows new release have discontinued the internal DVD movie player software,you just need to download another player software(Such as,VLC,GOM or MPC-HC) to play your DVD movies with our external drive. If you have any questions about this product by OSST, contact us by completing and submitting the form below. If you are looking for a specif part number, please include it with your message.